The Soho Manufactory was established by Matthew Boulton in Handsworth parish, outside Birmingham, in 1761. It was one of a number of factories in the midlands that made a wide range of goods, including iron, glass, and brass works. The Soho Manufactory was particularly famous for its metal ware. Industrial buildings had not been seen on such a scale before, so the manufactory impressed many contemporaries. Erasmus Darwin wrote in 1761: "Soho is the name of a hill in the county of Staffordshire, about two miles from Birmingham; which, a very few years ago, was a barren heath ... The transformation of this place is a recent monument to the effects of Trade on population. A beautiful garden, with wood, lawn, and water now covers one side of the hill; five spacious squares of building, erected on the other side, supply workshops, or houses, for about five hundred people." 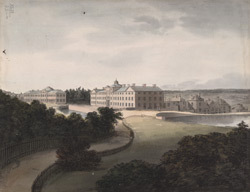 The manufactory was demolished in 1862-3.